This dish looks indulgent but won’t break the budget. 1. Combine all the spices in a mortar and pestle and crush them together. Generously rub the lamb shanks with the spice mix and leave to infuse for at least 1 hour but ideally up to 8 hours. 2. Preheat the oven to 150°C/gas mark 2. 3. 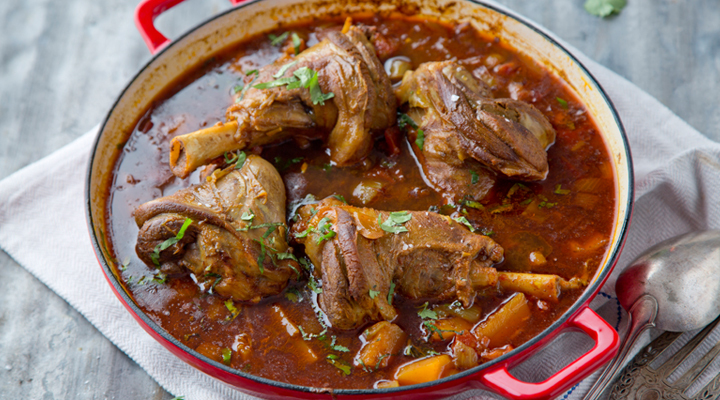 Heat the oil in a large heavy-based pan set over a high heat, then add the spiced lamb shanks. Season with more salt and pepper and cook for 3 or 4 minutes on all sides, until well coloured. Transfer to an ovenproof dish or casserole. 4. Add the onion and garlic to the same pan and cook for 2 minutes, until lightly coloured. Deglaze with some stock and pour this over the shanks with the rest of the stock and the tinned tomatoes too. Cover with a lid and cook in the oven for 2½ hours, until the shanks are almost falling off the bone. 5. Half an hour before the end of the cooking time, remove the dish from the oven and add the butternut squash. Cover and return to the oven for the last 30 minutes, until the pieces of butternut squash are soft. 6. Remove the lamb shanks from the casserole and place in a bowl. Cover with two ladles of the sauce and set aside. Add the couscous to the tomato and lamb cooking liquid in the casserole and set aside for 5 minutes, covered, until the couscous is plump. 7. To serve, fluff up the couscous with a fork and divide between wide-rimmed bowls. Add a lamb shank and some sauce to each bowl and sprinkle with some freshly chopped mint and coriander.